Halloween candy has been filling supermarket shelves for a few weeks now. I usually try to buy some early so that I have enough by Halloween, but to be honest, at least half of that candy is gone by the time the big day comes. I decided that I might be less tempted to open the candy if it was wrapped all cute and ready to give out at Halloween. I like to give the full-size candy bars to my nieces, nephews, and close friends, and save the fun-size candy bars for trick or treaters. 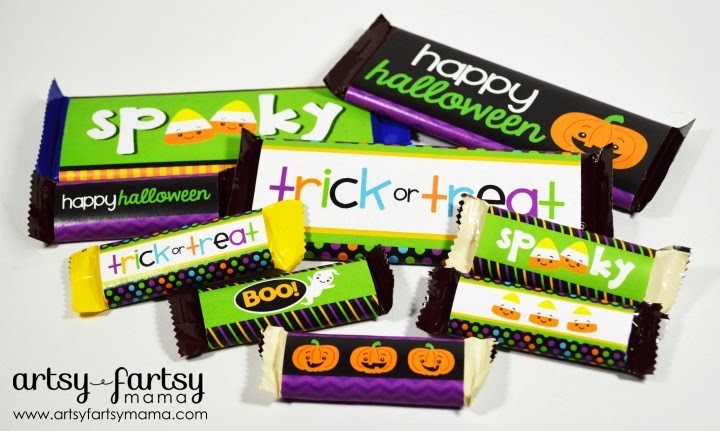 So, I've made FREE printable Halloween candy bar wrappers in both sizes and have multiple designs to choose from!! These would be a fun way to dress up your treats for giving out at school, sharing with friends, party favors, trick or treating, or more! There are candy bar wrappers made for both full and fun-size candy bars. They are measured to fit Hershey's and Crunch candy bars, but I'm sure they would fit other candy bars, too. Probably won't be a perfect fit, but they'd be close enough. Same for the fun-size candy bars. *Please do not remove the watermark. These are so darling! I think they are perfect for a class treat! These are wonderful! No candy allowed for school but this is exactly what I wanted to bring my son's friend when we go to his Halloween party! THANK YOU!! Thank you for sharing these adorable files!